The idea for this recipe came from one of my most beloved sources of culinary inspiration: the food section of The Guardian. Over the years, this has been the source of many of my most perverse veganizations of traditional British foods, but this one - courtesy of what Felicity Cloake claims is her "perfect" interpretation of a classic recipe - probably has the most awesome name. When my first son was little, he inherited a bunch of those National Geographic wildlife cards from an older cousin, and his favorite animal was the stump-tailed skink. Obviously, this was because it has pretty much the funniest name ever, and for awhile there it took nothing more than the words "stump-tailed skink" to ensure a storm of hilarity. Fortunately for my herbivorous agenda, Cullen skink has nothing to to do with the Tiliqua rugosa (a member of the Scincidae family of lizard native to Australia, featuring a heavily armored body and - you guessed it - short, stumpy tail), but is instead a thick, delicious soup of Scottish origin. Traditional Cullen skink is made from smoked haddock, potatoes, onions, leeks, and milk or cream. According to that renowned brainbox, Wikipedia, it is "a local speciality from the town of Cullen in Moray, on the north-east coast of Scotland...described as 'smokier and more assertive than American chowder and heartier than classical French bisque.' The name is partly (and indirectly) derived from Gaelic. The first element refers to the town of Cullen in Moray (a place name of Gaelic origin). The second element, 'skink,' is a Scots word for a shin, knuckle or hough of beef which has developed the secondary meaning of a soup, especially one made from these. The word skink is ultimately derived from Middle Dutch schenke 'shin, hough,' also the root of the English word shank. Others have hypothetized that it comes from the Middle High German word for a weak beer respectively liquor or essence." All this is very well and good, but how this "shank" became a smoked haddock remains - at least to Wikipedia - a mystery. 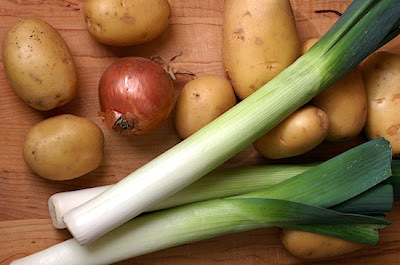 ~ In a large, deep pot, melt the margarine over medium-low heat and add the leeks and onions. Sprinkle with the salt and pepper, cover the pot, and allow to sweat (without coloring) until softened, about 10 minutes. ~ Add the diced potato and stir to coat. Pour in the soy milk mixture and bring to a simmer. Cover the pot again and cook about 20 minutes more, until the potatoes are tender. ~ Remove from heat, fish out the bay leaves, and allow to cool slightly. With an immersion blender (or in a food processor), partially puree the soup - you don't want it too chunky, but neither are we going for a completely smooth puree. ~ Reheat the soup, stir in the chopped parsley, and serve hot with crusty bread. Just came across this - it was delicious, if a bit scarily like the real thing! Just tried this, using oat milk. I do like my chowder chunky, so just pureed about a third of it and stirred it back in. I added the smoked tofu, to make a proper main course dish, it worked really well! Topped with chopped dill as well as parsley. Definitely one I'll do again! I'm an early modernist with a particular interest in literary representations of domestic violence in 16th and 17th century England. I'm also a happy (and decidedly non-violent) vegan with a compulsion for improving recipes that have traditionally called for less compassionate ingredients. I love my family, my partner, my animal and human friends, all things Jacobethan, and doing my small part to make the world a better place. Vegan Harry Potter Treats with Evanna Lynch! An update and a goodbye.